Special Containment Procedures: Due to its immobility, SCP-962 is to be left in the valley in which it was found. A █ kilometer perimeter is to be set up around the object. Any civilians seeking to pass the perimeter are to be turned away under the premise that a nuclear waste containment site is within. Any persons not affiliated with the Foundation found within the area are to be interrogated and issued Class A amnestics. A no-fly zone is to be enforced for the same perimeter. To discourage growth of SCP-962's range, four live cattle and two tons of timber are to be airdropped near SCP-962 on a weekly basis. Any balloons released by SCP-962 are to be shot down, and reasonable effort made to recover the manuscripts. Should a balloon escape and be found by a civilian, Class A amnestics are to be administered, and the balloon and attached writings confiscated. All manuscripts are to be stored in a minimal-security vault, with "rants" stored in a separate vault. Level two or higher personnel wishing to read materials produced by SCP-962 may submit a request to the project director. Description: SCP-962 is a large metal tower located in a valley in the ██████ Mountains in [REDACTED]. It is made primarily of steel, though other materials are present. The tower is approximately 281 meters tall, with a 2575 square meter base. It twists and tapers somewhat as it rises from the ground. The top third of the tower is empty. An inner wall in the lower area renders it opaque to imaging. SCP-962 can open an aperture anywhere on its surface. SCP-962 produces and controls an estimated 13,500 "servitors", collectively designated SCP-962-1. Specimens of SCP-962-1 are cybernetically augmented animals. These augmentations usually force the animals into a bipedal gait, and are often accompanied by crude cosmetic alterations such as the removal of a snout, with the apparent goal of making the servitors appear more human-like. 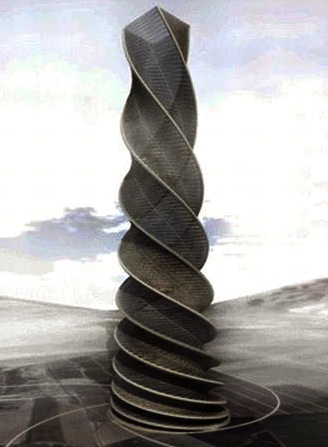 The nervous system of members of SCP-962-1 is slaved to implanted electrodes, which allow them to be controlled by a central source, assumed to be the tower itself. These servitors fulfill a number of roles. Many of them mine for ore in an extensive system of tunnels excavated below the valley, which is then refined by the tower. Others repair damage to the structure or other servitors. A small number construct roads, apparently to facilitate movement of SCP-962-1. The remaining servitors hunt down and destroy all non-human life in the valley. There are no recorded instances of any member of SCP-962-1 attacking a human or a machine, even in self-defense. Frequently, the corpses of animals killed in these hunts are brought back to SCP-962 for conversion into SCP-962-1. Plants may also be returned for use as fuel. Despite the damage caused by their augmentations, servitors are very effective at their roles, and seem to be built specifically for them. Approximately sixty times a day, SCP-962 will release a hydrogen-filled balloon from an aperture in the empty region near its top. These balloons are made from animal tissue of varying species, believed to be from the animals brought in by SCP-962-1. Attached to each balloon is a manuscript, written in English and typically on paper or vellum. The length, content, and style of writing varies greatly. Manuscripts have taken a variety of forms, including poems, novels, and collections of essays. These manuscripts exhibit no anomalous properties, but are generally of extremely high writing quality, strongly suggesting sapience on the part of SCP-962. Of possible note is the general optimism present in these writings, as well as the lack of any mention of non-human life. Very rarely, SCP-962 will release a balloon with a document attached that is a departure from its usual writings. These manuscripts are disjointed, rambling, and bizarre "rants", the exact meaning of which is unclear. In them, SCP-962 explicitly praises humans, consistently identifying mankind as the "Great Ones" it is trying to please. See Document 962-382 for an example. The origin of SCP-962 is unclear, though estimations based on its mining rate suggest that it has existed for no more than twenty years. Document 962-382: The following is an excerpt from one of SCP-962's rants. Grammar, punctuation, and emphasis have been left the same, though text color has been omitted. who greater than you your majesty your sublime nature Great Ones do I do right?